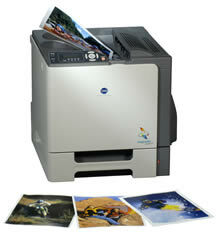 The magicolor 5440 DL whips out crisp, exciting prints at an amazing 27 ppm, in both black & white and color. This network-ready speed demon is so versatile that it can support almost any application for users throughout your entire office. And, it features an optional camera direct photo printing card, allowing you to print pictures directly from your digital camera. With the 5440 DL as your high speed, whole-office solution, you can watch your business performance soar to the extreme. Share the value of the magicolor 5440 DL throughout your entire office via the built-in 10/100BaseTX Ethernet and hi-speed USB 2.0 interfaces. Print rich, vibrant color on a variety of media types, including plain paper, labels, envelopes, transparencies, glossy and thick paper. Easily produce photos from your digital camera using the optional camera direct photo printing card, which eliminates the hassle of downloading photos to your computer. Do away with your monochrome-only printers. With the economical cost per page of its color or black and white prints, the 5440 DL can be your office-wide, multi-tasking workhorse. With a maximum paper capacity of 1,600 pages, up to 12,000 prints per toner cartridge, and a duty cycle of up to 60,000 prints per month, the 5440 DL lets you quickly and easily print large volumes of material. Send it and forget it. Built-in reliability features, including automatic media size detection, auto tray selection, paper-jam recovery, and automatic color calibration, mean there’s no need to “babysit” your print job. Our single-pass laser technology allows you to print at fastest rated speeds in even highest resolution mode. With the 5440 DL’s exceptional print quality, the fine lines, details, halftones and subtle shadings in your document come alive--grabbing your audience with high-impact color that gets your message heard. quality labels, and envelopes. Automatic duplexing on plain paper only. Other: No notes at this time. Note: The stated life expectancy of each consumable in your printer is based on printing under specific operating conditions such as page coverage for a particular page size (5% coverage of letter/A4). The actual consumable’s life will vary depending on the use and other printing variables including page coverage, page size, media type, continuous or intermittent printing, ambient temperature and humidity. Compatible with all Windows and/or TrueType® fonts printed via Windows GDI, Macintosh, or Linux utilities. One (1) resident typeface included. * The addition of some options, in some combinations may cause the product to become non-compliant. Energy Star compliance does not represent an EPA endorsement of any product or service.